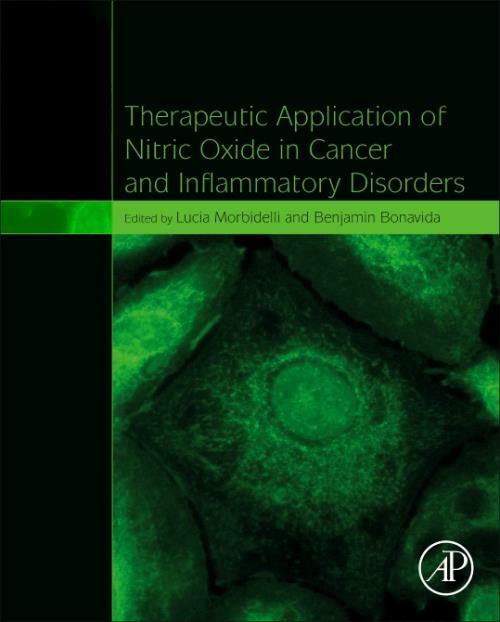 Therapeutic Application of Nitric Oxide in Cancer and Inflammatory Disorders presents updated reviews on the chemistry, signaling, pre-clinical and clinical activities on the role of nitric oxide donors/inhibitors used alone and in combination with other therapeutic agents for the treatment of a variety of diseases. This book examines various studies related to the application of novel therapeutic NO (donors/inhibitors) compounds in the treatment of various cancers. These studies have been shown to exert significant therapeutic activities against various cancers and various inflammatory diseases such as rheumatoid arthritis, Crohn's disease, allergies, and asthma, where no current effective therapies exist. Pathologies based on functional and structural vascular alterations are also taken into consideration. Edited and written by internationally renowned experts in the field of novel therapeutics for cancer, this book is a valuable source for cancer researchers, medical scientists, clinicians, clinical pharmacologists, and graduate students. Dr. Morbidelli's experience is within the pharmacology of angiogenesis and microcirculation by means of a plethora of in vitro and in vivo models. Since 1993 she contributed to demonstrate the role of nitric oxide pathway in the process of angiogenesis induced by growth factors and drugs. She published 130 papers and chapters in books on the molecular and cellular aspects of angiogenesis mainly in relation to tumor development and progression. From 2012 to 2015, she was a member of the COST Action BM1005 "European Network on Gaseoustransmitters taking part to the annual meeting of the network and collaborating/interacting with members of the European Union. In the last years, as founder and partner of a spin-off devoted to the development of NO donors, she is contributing to characterize new NO donors in cardiovascular, cancer and inflammation related disorders. Dr. Bonavida is internationally renowned by his expertise and various publications in the field of tumor cell sensitization to chemotherapy and in particular the novel role of Nitric Oxide (NO) donors in chemo-sensitization and reversal of drug resistance. He was the first individual to co-organize the first international workshop on NO and Cancer with Dr. Jean-François Jeannin in Paris. Subsequently, they co-organized three additional conferences on the same topic. The last fourth workshop was held in March in Sevilla, Spain with Dr. Muntane, and the proceedings were published in Redox Biology recently. These conferences focus on NO and derivatives in cancer and their therapeutic applications in resistant cancer.